By the beginning of 1918 events were turning against Germany in the long term. Although Russia had effectively dropped out of the war, the USA had joined the Allies in April 1917 and Germany’s main ally, Austria-Hungary, was becoming significantly weaker. 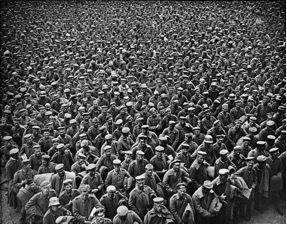 US troops had not yet arrived in Europe in any strength, but Germany now had large numbers of troops released from the war against Russia. German leaders realised that there was now a window of opportunity to win the war before US troops arrived in strength, during which Germany had a superiority in numbers in France and Belgium. A series of major offensives was planned during the Spring, the first of which, codenamed Michael, was to be launched against the British 5th Army. This attack saw the end of deadlock on The Western Front and the return to open warfare, last seen in 1914. The scale of the German attack launched on 21 March 1918 was colossal. 74 divisions were available to launch an assault across a 60 mile front. Over 6,000 guns fired more than a million shells in the opening five hour bombardment. Using tactics developed in late 1917, groups of storm troopers moved forward seeking weaknesses in the British lines and driving into allied held territory. Artillery and mass infantry attacks then dealt with defenders left behind. The British were aware that an attack was imminent and desperate attempts were made to create a system of defence in depth, with a forward zone, designed to be lightly held via a series of strong points, and a battle zone where it was hoped that the German offensive would be halted. However, events conspired against British preparations. The section of line attacked had recently been taken over from the French and was in a poor state of readiness. The British Army in France was recovering from a major reorganisation and was significantly under strength as the Prime Minister Lloyd George, mistrusting the British commander Douglas Haig, held troops back in Britain. The weather also placed British defenders at a disadvantage, when on the morning of 21 March, thick mist cloaked the Germans attacking their lines. The initial attack met with great success and the British defences were overwhelmed. Supported by the French, they carried out a fighting retreat, eventually holding the Germans in front of Amiens, over 30 miles from their front line on 21 March. The Germans were brought to a halt on 5 April. The Allies lost 1,200 square miles of ground and lost 270,000 men in the process, many of them prisoners. However, the German Army had lost 240,000. The offensive was essentially a failure, in that it failed to achieve its objective of forcing the British to pull back to the Channel Ports. The allied line held and no key strategic points were lost. One consequence of the German offensive was that the French General, Foch, was given overall responsibility for coordinating Allied strategy. A second attack was launched against the British 2nd Army across The River Lys on 9 April, codenamed Georgette. The result was similar to that of 21 March. The line gave way and the Germans gained considerable ground. However, German losses were considerable, no strategic objectives were taken and the Allied line held. Three further German offensives took place between May and July, now against the French, but none achieved any decisive result. By July it was obvious to Foch that the Germans were nearing exhaustion. The French, together with US troops, counter attacked across The River Marne and the Germans were pushed back. The Allies now began a series of offensives which would push the German Army back across France and Belgium and ultimately result in Germany suing for peace, in a period which became known as The Hundred Days. The first of these offensives took place on 8 August, when The British, spearheaded by The Canadians and Australians, attacked the Germans in front of Amiens. The Germans fell back in what the German commander Ludendorff called, “The Black Day of the German Army.” This was a modern “all arms” battle, which illustrates the way in which tactics had changed completely from those of the first two years of the war. There was no preliminary bombardment and over 600 tanks had been amassed to lead the attack, with aircraft sweeping before them strafing German defenders and bombing positions in the rear. It was clear now that a German defeat was inevitable. The German Army was unable to replace its losses, while US troops were arriving at a rate of over 200,000 a month. However, German troops fought back stubbornly and there were still formidable German defensive systems, in particular The Hindenburg Line. 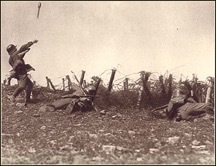 A series of attacks was now launched against the German lines. On 12 September the first all American attack took place to the South of Verdun and on 26 September The British, French and Americans began to attack along the whole front. On 29 September The British 46th Division broke through the Hindenburg Line and the German Army was in headlong retreat. On 4 October, the German government telegraphed President Wilson and requested peace terms. However, although the last months of the war saw decisive victories, the cost was heavy. The British suffered the greatest casualties during this period and some of the highest of the whole war.